Benelux is the common word used for the formereconomic union of three countries: BElgium, Netherlands and Luxemburg, in the North of Western Europe. The three countries together have today (07/2007) a population of about 30 millions people (07/2007): BElgium 12 millions, Netherland 17 million and Luxembourg 0.6 million. 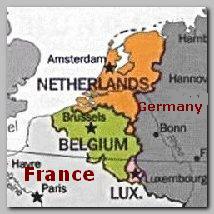 Benelux stretches on 77,000 km: BElgium 30,500 km, Netherland 41,500 km and Luxembourg 2,500 km. All the three countries do not have a history of conflict or occupation of an Arab Islamic territory although HOlland – Netherlands, was before World War II the colonial power in Indonesia, with the biggest Muslim population in the World. Indonesia practices a moderate version of Islam and from HOlland’s occupation there are no sediments of tension. About 5% of the general population in Benelux is Muslims: over 400,000 (3.5%) in BElgium and over 1 million (6%) in HOlland – Netherlands. In general Benelux does not suffer from Islamic radicalism in the degree that France, Germany or U.K are stricken but most of the Islamic terror networks are operating all over Europe. Islamic activists moves from country to country to avoid arrest and take advantage of the liberal approach and the easy border crossing to look for proper targets also in Benelux, such as Jewish institutions and synagogue, USA military basis or other facilities.